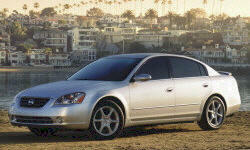 Nissan Altima Pros and Cons | Page 1 of 6 | Why Not This Car? Nissan Altima nice looking affordable car, but you get what you pay for! These cars look good, and are very cheap, but now I am realizing why they are so affordable. So far, great! The comments below only apply to the 3.5 S.R. Altima! 80 miles total commute each day, average 30mpg with a 70% highway and 30% city roads. CVT helps make that mpg count very high for a gas engine and relatively weighted sedan. Extremely comfortable and well designed family sedan. My first Nissan, after being a VW fan, but I am very impressed, so far. Still, I have some dislikes about this particular model level. Great car but features of built in GPS could be significantly better. My first brand new car in 21 years. It has exceeded my expectations so far and hope it always will. Great car NOW! There were some issues with 2013 altima but they got it right now! I read a lot of the reviews on the 2013 Altima and still bought the 2014! yeah I knew about the transmission rattle and vibration noise. They seem to be fixed! Much better sound insulation too! the 2014 is a new class of Altima! The 2013 Altima is a great car and a great value and made in the USA. DANGEROUS CAR - DO NOT BUY! Nissan seems to have a great formula for the Altima - a nice package, comfortable, tons of room and a pleasant driving experience. Pretty bad. I'm getting 21 mpg on highway. The seats are very comfortable, I would have been happy if both the driver and passenger were electronic. The lumbar support is fantastic and the driver seats is 8-way adjustable. For tall people this car will be a great ride. We have owned 4 Maximas in the past, and were considering another, when we took a drive in this car. If you're a Maxima fan, don't drive this one or you'll take it home! the pre cat in front of the engine block has a bad coating and bad design. the coating flakes off and gets sucked into the engine. catastrophic engine failure. requires after market header to keep the engine reliable for longer time. This 2002 has soft and smooth wheel travel over bumps or sudden hill drops back end gets absorbed with a lot of travel down and up resulting in soft bump ride and not harsh wheel impact in ride characteristics.